Set on a striking black background, this French floral tapestry "Hibiscus Black" shows a glorious bouquet of flowers on a marble table. The attention to detail and the play of light on each flower bloom and petal can be admired in this piece, where the French tradition of the botanical study shows each flower in its most accurate and artistic way. Such still life pieces turn the floral study into botanical still lifes, and here this piece creates a wonderful atmosphere by setting the flowers in a dark background. 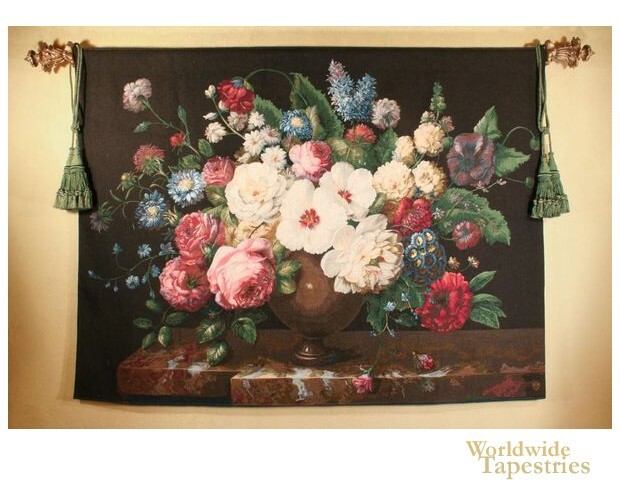 Full of beauty, this French floral tapestry "Hibiscus Black" is backed with a lining and has a tunnel for easy hanging. Note: tapestry rod and tassels, where pictured, are not included in the price. Dimensions: W 59" x H 44"
Dimensions: W 79" x H 60"